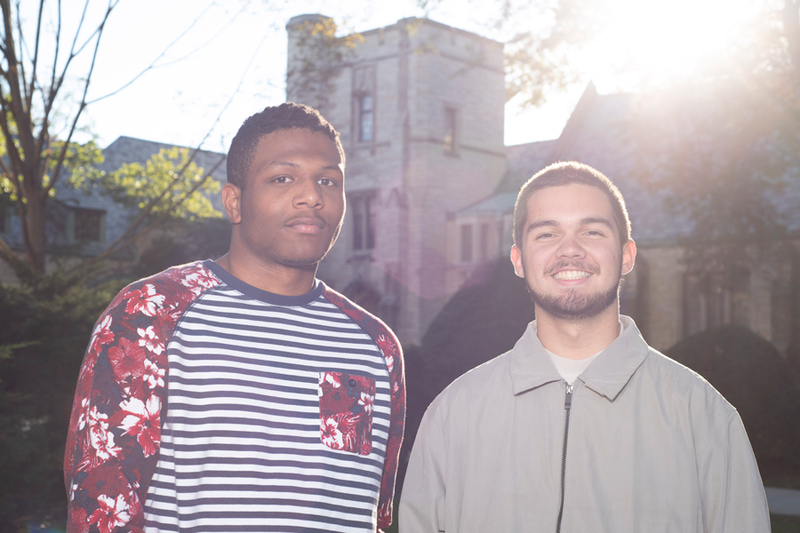 Medill freshman Taj Smith (left) and Weinberg freshman AJ Denhoff, the creators of the track “Josh McKenzie.” Since its release on Smith’s Soundcloud, the song has been played over 1,500 times. Two freshmen made their musical mark on Wildcat Welcome this year when they collaborated to release a hip-hop song honoring popular University administrator Josh McKenzie. Weinberg freshman AJ Denhoff and Medill freshman Taj Smith — the latter of whom performs under the name Saint Zo — released “Josh McKenzie” on Denhoff’s SoundCloud on September 24. In the three weeks since, the song has been played over 1,500 times. “It encapsulates the feeling of Josh McKenzie,” Smith said. The idea for the track came during Wildcat Welcome. Denhoff wrote the song’s hook “Josh McKenzie, I feel like Josh McKenzie/See me smiling, man I feel so friendly” on the second day of events. Denhoff first met Smith while leaving Norris at Night, he said, and the two began getting to know one another while walking to north campus. The conversation eventually turned to music and they discovered their shared passion for composing hip-hop, he said. Denhoff told Smith he was working on a new song, though he didn’t mention the Josh McKenzie theme, and invited Smith to his dorm to collaborate. In the following two to three hours, they composed most of the song, he said, writing the majority of the verses and recording Smith’s vocals. Smith said they struggled to get together again after that first night due to their differing Wildcat Welcome schedules, but managed to record the last of Smith’s verses in about 10 minutes while Smith had lunch at Allison Dining Hall. The track was released just days after Smith and Denhoff first met. The song spread through the student body, Smith said, after he showed it to his peer adviser, Medill junor Zach Koons, with Koons posting a link to the track in the PA Facebook group soon after. Koons said the PA community loved it, and many shared the song with their own first-year students. And as for Josh McKenzie? Though he did not respond to request for comment, Koons said he spoke to McKenzie about the song, adding that McKenzie enjoyed the parts he heard, but didn’t necessarily appreciate the attention. “He was really overwhelmed by it,” Koons said. Smith and Denhoff — who continue to collaborate — have yet to talk to their muse about the song. Though Smith said he had the chance to talk to McKenzie during Wildcat Welcome, he didn’t follow through.